How wonderful! But how to make it happen? As Sabi Star cruised through the Eastern Caribbean, we were thinking about what kind of boat we wanted. It kept coming out a trimaran, which is probably my father's influence. Dad had long wanted to build a trimaran and sail to the South Pacific. One evening we were having a few drinks ashore at Pat's Pub in Rodney Lagoon, St. Lucia. We decided to head back to Sabi Star and a young British woman asked for a lift back to her boat. We said fine, and asked her which boat she was on. She pointed out a nice trimaran we'd noticed earlier. We complimented her on the boat and she mentioned that it was for sale. Oh, my... The next morning we talked to her boyfriend, Jan. He showed us the boat (much more nicely finished than Sabi Star) and mentioned that he was looking for $37K. Now, we knew nothing about boat prices, but motor-homes were going for ~$1,000/foot, and Oriental Lady was a bit cheaper than that. Moreover, Sue had come into a small inheritance, so the price was something we could afford (although the money was supposed to be a down-payment on a house). We told Jan that Sabi Star was sailing to Martinique that day, but that we'd get off the boat there and wait for Oriental Lady to meet us. In Martinique, Sue, Chazz and I moved off Sabi Star, rented a small Renault, and set up camp in a small beach campsite. We'd bought a large inner-tube and lashed a piece of plywood to it as a dive platform. With this tied to the roof of the car, we went in search of dive sites. After a few days, Oriental Lady sailed up from St. Lucia and we arranged to do a test-sail the next day. Now, Fort-de-France bay is big, and a good breeze blows down it during the day, but the nights are calm so there are usually no waves in the morning. That morning there was a brisk breeze but no chop so our test sail was close reaching back and forth across the flat waters of the bay with the full main and the #2 jib. We were screaming back and forth at 10 knots! After crossing the Atlantic at ~3 knots, this was absolutely awesome! More importantly to us, Oriental Lady was obviously a well-cared for home. Jan had been on board for ~12 years. He never had much money, but he had considerable skill, and it was obvious he'd put a lot of love into the care and maintenance of his floating home. Oriental Lady was also well proven, having sailed from Japan, most of the way around the world. Oriental Lady was a 40' Piver AA design. Arthur Piver is often considered the father (grandfather?) 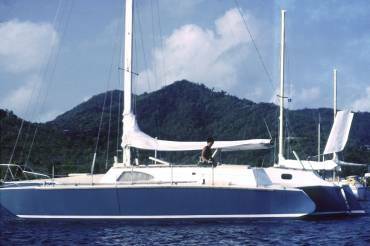 of modern multihulls. He experimented in San Francisco Bay in the 1960s, building some boats, writing a few (bad) books, and selling lots of boat plans to aspiring backyard boat‑builders. His fiberglass‑over‑plywood trimarans were relatively roomy, fast, and cheap to build. Problem was, many of these backyard builders lacked some talent and many altered the plans in poor ways, so their boats often left much to be desired. Because of this, Piver, started getting a bad name. To counter this, he drew up a set of plans he dubbed the AA, which he only released to professional boat yards. Oriental Lady was built by New Japan Marine in 1967 at the request of a retired naval officer. He sailed her south to Micronesia, through (he claims) 5 typhoons. He self-published a book of this trip, called Magnificent Ordeal, copying Piver's horrible third‑person style ("the skipper" did this, etc.). After a year he chartered Oriental Lady to the Peace Corps in Micronesia, to shuttle sick Peace Corps volunteers from the outer islands to the hospital. Jan was the skipper and obtained title to the boat in a secret agreement. He eventually sailed to Australia, where both the mizzen and the missus (his wife) got off the boat. He continued on to Singapore, where Carolyn joined him. Together they spent 6 more years sailing across the Indian Ocean, up the Red Sea, through the Mediterranean, and across the Atlantic to the Caribbean. Oriental Lady was much more aesthetically pleasing than Sabi Star. Coming down the companionway from the cockpit, there was a small galley with a stove and oven to starboard, and a sink and small gas fridge to port. Just forward was the saloon, with a beautiful walnut-bark table and seating for ~8. To the sides (over the "wings") were 2 double beds with somewhat limited headroom. Since these were usually empty and had large windows, Oriental Lady had a light, airy feeling below. Continuing forward under the main cross-arm, was the master cabin, with a huge 8' bed and the only head (bathroom). There was a 35hp Isuzu diesel under the cockpit and a small single cabin aft. She carried a masthead sloop rig, with a transom-hung rudder connected to a simple and elegant wind-powered self-steering vane. The mainsail and 180% genoa were brand new, and there were 3 other headsails. 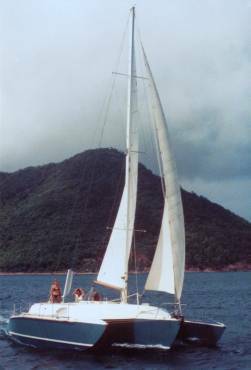 We moved our stuff onto Oriental Lady and sailed with Jan and Carolyn back down to St. Lucia, where there was a Lloyds registered yacht surveyor from New Zealand. For $50 he gave his blessing and we proceeded south to St. Vincent. Now came the hard part - did we really want to sink all the money we had into this unknown adventure? What would our friends and parents think? What would this do to our careers? Could we really pull this off? Jon's poor brother, Chazz, had to suffer through all our indecision. Even once we decided to bite the bullet, it took a week for our bank to transfer the funds to Jan's bank, during which time the boat was sort of in limbo, and tensions on board reached new highs. In May 1981 we bought Oriental Lady, having our 2nd wedding anniversary on our "yacht" in the Caribbean. ("Yacht" is how you describe your boat to someone who has never seen her, and is never likely to do so. ) The problem now was that we'd been on the road for ~16 months and were seriously out of money. We needed to go back to the US and work, so we sailed Oriental Lady back up to Rodney Bay, St. Lucia, and prepared her for our extended departure. Jan and Carolyn delivered a charter boat back up to the US and Chazz went along as crew. The story now continues with our Yacht Delivery. By the way, Oriental Lady, built in 1967, is still sailing in Half Moon Bay, south of San Francisco, California!